When all doubt subsides in you, and you feel like you just can’t take another bad day, know that tomorrow and the next day after that and the next day after that is a brand new day to start anew. Don’t let your bad days get to you, because the good days are around the corner. Learn from your past experiences, your failures, your mistakes, your fears,… whatever it is that gets to you and under your skin. Above all else, you will win. You will fight the bad days and you will survive. You are a strong individual, a fighter, and you will conquer your fears, and you will rise. Be inspired today, tomorrow, and for your future to help yourself out of that rut. Watch this video, and you can kick back that bad day to where it came from. If you got value from this post, like and comment please. 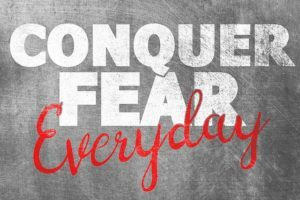 Please comment and share if you enjoyed Conquer Your Fears and Rise.